Its that time of year again guys and gals, that time at the end of the summer where kids start going back to college, which means the start of the College Football season. I will be profiling the major conferences in the FBS (Formerly Division-I) program and discussing how these schools did last season, how they stack up against some of their major opponents this year, the big names to follow for Heisman/ All-American/ All-Conference players, and any surprises that could happen throughout the year. Moving from the east coast to the west coast, I will break down these major conferences, starting with the ACC. After going 10-4 under first year head coach Jimbo Fisher (who replaced the aged Bobby Bowden after his 30+ years of service) last season, Florida State heads into the fall as a favorite to win the conference and take the championship. The Seminoles could also establish themselves as legitimate national title contenders when they host the Oklahoma Sooners on September 17th. Oklahoma is one of the favorites to win the national championship this season, opening the season ranked #1 in the pre-season polls. Florida State hasn’t been anywhere close to being a national championship contender since their last national title in 1999-2000. Since 2005 (the year of the inaugural conference championship game.) The Virginia Tech Hokies have won the conference four times. Virginia Tech is also the only FBS program to win at least 10 games in each of the past seven seasons… did someone say rivalry? The Seminoles’ luck might change this season, as FSU returns a plethora of talent on both sides of the ball from that 10 win team from last season. My prediction: They should win ten games, make the ACC title game for the 2nd straight year and have an outside chance for the national title if they stay healthy…but don’t push your luck. Clemson ranked 10th out of 12 in the ACC last season in both points and yards per game. Their new offensive coordinator Chad Morris, a long time high school coach, only has one year of college experience as Tulsa’s offensive coordinator last season. But he did a heck of a job in that one year. The Golden Hurricane ranked 5th in the nation in total offense and sixth in scoring (41.4). This helped the Golden Hurricane to a 10-3 record, not too shabby for a first year coordinator. 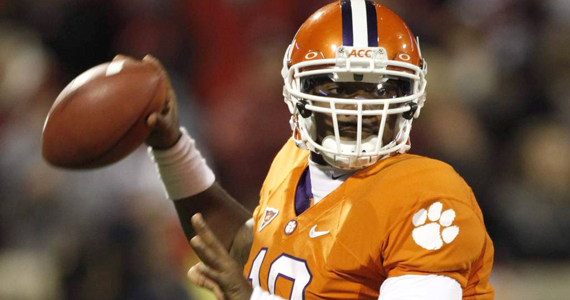 Clemson’s success depends on how well first-year starting QB Tajh Boyd adapts to Morris’ scheme. Boyd won raves this spring for his ability to run the offense but he needs to prove he can do it in the fall. Defensive Coordinator Kevin Steele has built Clemson’s Defense into one of the ACC’s best since taking over in 2009. Clemson should win its first two games of the season when they kick off against Troy and Wofford at home, but the schedule gets downright frightful as the Tigers play back-to-back home games against defending national champion Auburn & Florida State and then travel to Virginia Tech. My Prediction: If Morris can ignite the offense, 8 wins as the surprise of the ACC Atlantic this year. Realistically they’re looking at 6 wins, I would give this team another year or 2 and they should be contenders in the ACC. Let’s move onto our own Jobu’s alma mater: Boston College. The Eagles feature an elite running back in Montel Harris who has been a dominating force in their running game for the past two seasons. He has a solid chance at finishing his career as the leading rusher in ACC history, but for the most part, he has been the only offensive threat for Boston College in the past two years. The Eagles will seriously need full contributions from everyone on offense in order to change their fate this season. BC ranked an abysmal 109th in the nation both in yards and points per game. Even though Harris is one of the nation’s best running backs, their only chance of competing for an ACC Atlantic Division title will depend on who can step up and help Harris in the backfield. 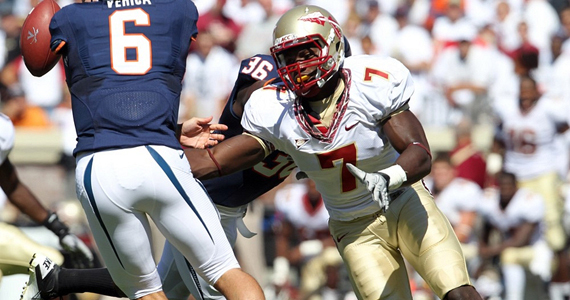 They do boast a solid run defense, returning seven starters from a unit that led the nation against the run in 2010. Thanks in large part to that defense, the Eagles finished the 2010 regular season with a five-game winning streak where they didn’t allow any opponents to score over 16 points in any game. They do play one of the more difficult schedules in the conference, eventually facing Clemson, Virginia Tech, and Maryland all on the road and in consecutive October games. My Prediction: BC will win 8 games this year as long as Harris stays healthy and they can find ways to spread the offense around and not rely primarily on the running game. Following a successful season and a bowl victory in 2010, Maryland looks to continue its successful run this season. One main focus will be that of the newly acquired head coach Randy Edsall. Many might remember him as the coach who brought University of Connecticut to its first Big East title & BCS game (they were brushed aside by Oklahoma in the Fiesta Bowl). 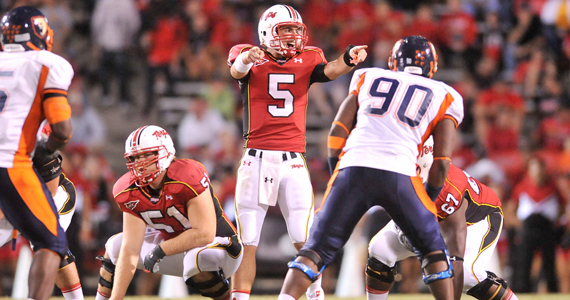 Edsall inherits probably the most proven Quarterback in the ACC in Danny O’Brien (2,438 yards passing, 22 TD 8 INTs). As a redshirt freshman, O’Brien became Maryland’s first ACC rookie of the year since the conference started giving out the award in 1975. They also have some talented running backs to work with in Davin Meggett (son of former NFL star David Meggett) and D.J. Adams. Meggett had a team-high 720 yards last season and Adams rushed for 11 touchdowns (including 4 in the Military Bowl). Maryland’s defense ranked fourth nationally in turnover margin last season(+15), but a year earlier they ranked 97th in turnover margin (-6) and went 2-10. As you can see, their chances at success depend on how they make plays on defense and force other teams to make mistakes. Maryland plays its first four games at home (beginning to see a trend here in the ACC) but is away from College Park for a pivotal match up vs. Notre Dame, which takes place at the Neutral site, FedEx Field. My Prediction: I like them to win 7 games but I don’t believe they will be repeat that turnover margin again this year. Add a new head coach in to the mix and I feel that MD might struggle for a few weeks of the season. After what I would consider a solid 2010-2011 season for NCSU, they are going to be without All ACC select QB Russell Wilson, who opted to play elsewhere this season. 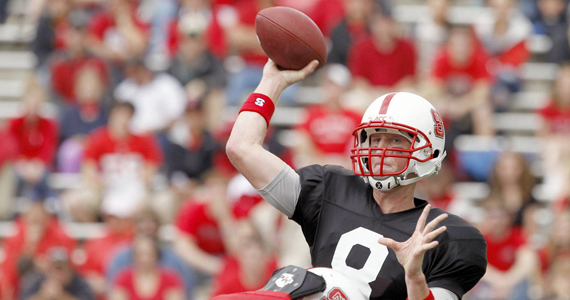 Get used to hearing about Mike Glennon, because NSCU’s season will depend on him. Glennon, a former Rivals top 100 prospect, has little game experience and is a completely different type of QB than Wilson. Where Wilson was someone who would rather run and make plays with his feet, Glennon has a strong arm but runs like Bernie Kosar & Drew Bledsoe. He is the definition of a traditional dropback QB. It doesn’t help that their best deep threat is tight end George Bryan (All-America candidate, 35 catches and 369 yards last season). It Looks as if they are going to struggle a bit offensively. On the other side of the ball, NCSU returns eight starters, including four from the secondary. Audie Cole and Terrell Manning, who combined for 161 tackles last year, will both be returning for the Wolfpack as well. The Wolfpack defense ranked 2nd in the ACC and 14th overall last year in run defense, which will be a huge boost for the team. They have the ability to stop the ball, which takes some of the pressure off of the offense, but that means that they will need to play mistake free football in order to be successful. It helps that their schedule really isn’t that tough. Their first two home games are against Liberty & South Alabama, and their only real tests will come against Florida State, Clemson & Maryland towards the end of the season. My Prediction: 5 wins just on their defense alone, but they lack a strong leader at QB and a good receiving core. Defense might win championships, but not in college. Finally, we have Wake Forest, a team who has so many issues going on right now that it could be a few years before we even see them getting back into bowl contention. The Demon Deacons finished 11th in the 12-team ACC in scoring, total yards, and passing yards. Their success will depend on the ability of the offense, especially QB Tanner Price and RB Josh Harris. Price took the reins as the starting QB as a true freshman last year and heads into fall camp as the likely starter. Harris rushed for 720 yards and seven touchdowns on 126 carries last season, with his best moment coming in a 241, 2TD performance against ACC Champions Virginia Tech. They will be working behind a big offensive line that is bringing back all four starters (all upperclassmen). If they are looking to make any sort of impact and move out of the cellar, it will have to be with the running game. They do return nine starters on defense, but, in this case, that might do more harm than good. WF ranked 110th in scoring defense last season and let four teams score at least 48 points against them. Their schedule, for the most part, is not overly difficult. They have a chance to play spoiler against FSU, VT or Notre Dame at home, although it is highly unlikely. They open up on the road against the Syracuse Orange on the Thursday night football spotlight this season, which will not be an easy task (going into the Carrier Dome is very hard). My Prediction: With a relatively difficult schedule, they won’t get more than 3 wins. They might be able to upset a top team, but better luck next year.